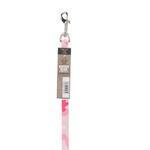 Bring your dog on a walk with a dog leash that's both tough and stylish! 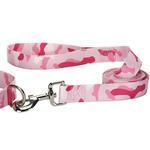 We love the combination of the different shades of pink on this rugged camo leash! The Guardian Gear Camo Dog Leash in Pink is made of durable, woven nylon and includes a heavy-duty swivel clip for secure collar attachment. It's heavy-duty hardware and thick nylon make this collar dependable and fashionable. Posted On 09/10/15 by Linda C from Riverside, RI Yes, Linda C recommends this product! Nice quality and good length. Am sure it will last a long time.